After more than 14 years trying, researching and then successfully mass-producing, Minh Long has officially launched a new product line that differs from its previous ventures. Macrobiotic or Healthycook premium porcelain can easily spearhead the cookware market thanks to its outstanding features including compatibility with a variety of waterless cooking methods (boiling and steaming), low-heat frying, faster stewing time and greater energy efficiency, which is known for preserving more nutrients and natural aromas as well as preventing diseases. 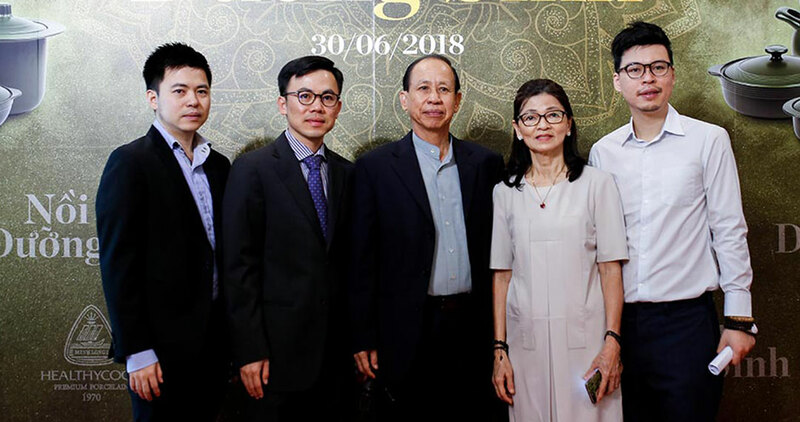 On June 30, at Minh Sang Plaza, Minh Long I Co., Ltd. introduced one of its special product line, which they proudly called the “revolution” of healthy porcelain ware. The special programming press conference was hosted with attendance of 150 VIP guests including provincial and municipal authorities and celebrities such as Minh Long Healthycook Brand Ambassador – singer My Linh, Miss Vietnam 2010’s First Runner-up Hoang My, Meritorious Artist Kim Xuan, Meritorious Artist Hanh Thuy, actor Ha Tri Quang and numerous food and cooking experts, doctors and business partners (Tiki.vn, Vinmart, AEON) along with journalists. 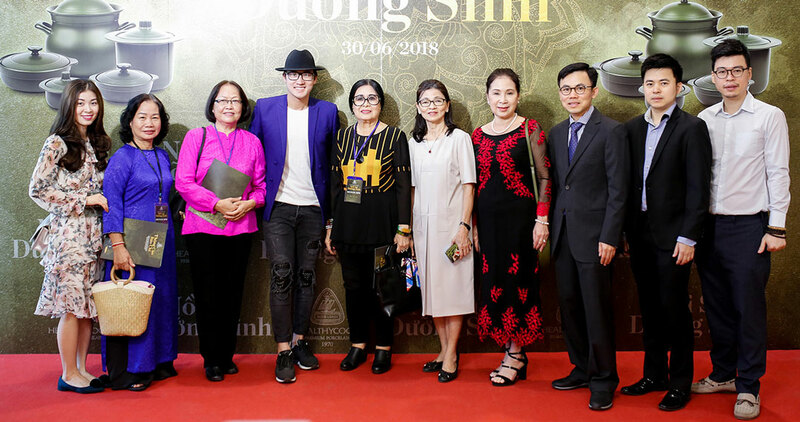 Artists and culinary experts participated in the event alongside with Minh Long board of management. 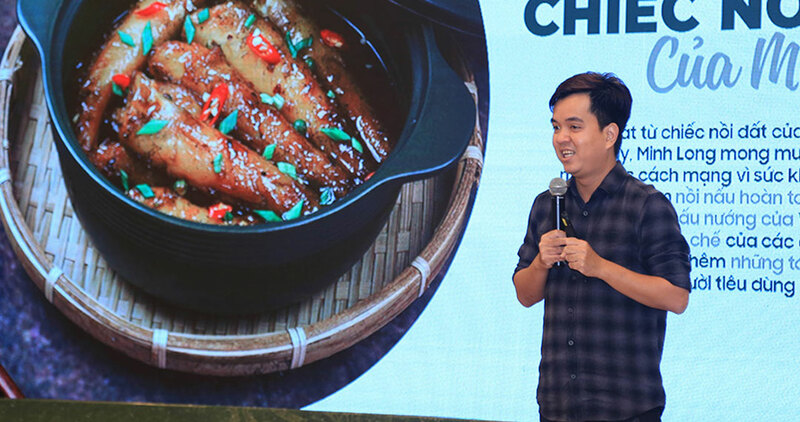 Minh Long board of management joined a photo call to show their pride and confidence in the new product line – Healthycook Premium Porcelain. 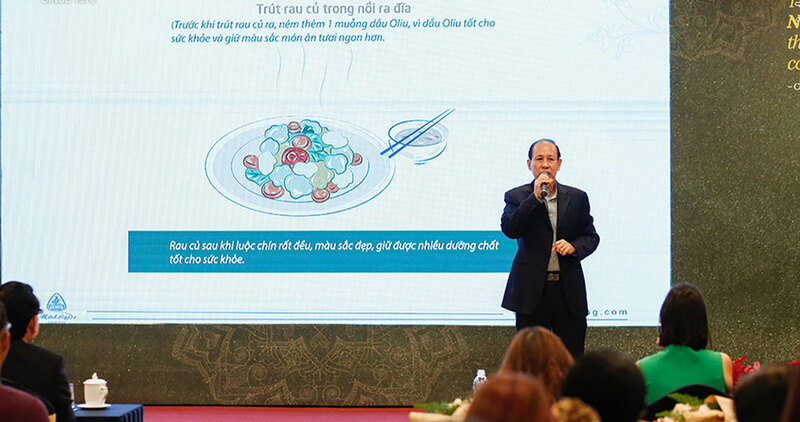 General director Ly Ngoc Minh explained the mechanism of Healthycook premium porcelain. Macrobiotic porcelain made from rare materials owns a modern shade of moss green, which represents its healthy features and benefits such as reducing cancer risks and cardiovascular diseases through cooking, shortening stewing time, saving ingredients and retaining flavours as well as food aromas. 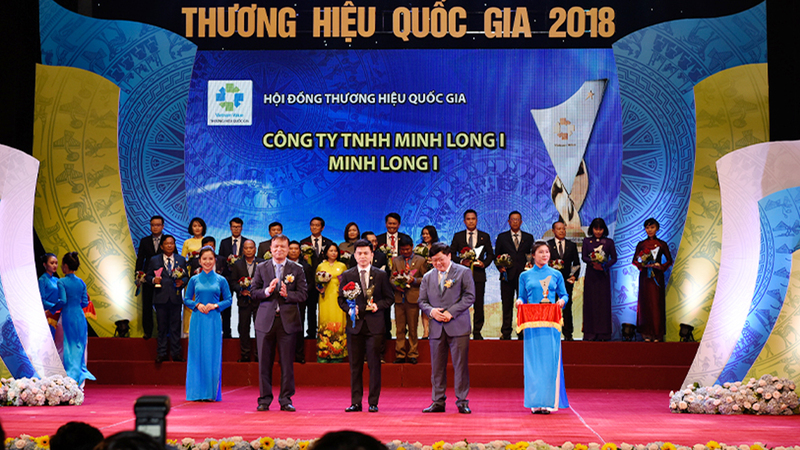 In addition to Mr Minh’s interpretation, Mr Ly Huy Sang, deputy general director, also shared untold stories behind the procedure of selecting and pulverizing rare materials extracted from mines both locally and abroad for one of challenging productions to release Vietnam’s first high-quality cookware. The porcelain company also made an official announcement to make Vietnamese diva My Linh its brand ambassador. “I am quite picky and well-rounded when it comes to cooking and choosing food for my family. For years we have been dieting macrobiotic way which boasts healthy eating habits and prevents illnesses. When we first heard about Minh Long’s macrobiotic porcelain cookware, we went from being curious and surprised to completely convinced by their amazing features which comport with different waterless cooking methods such as boiling without water, fast stewing and braising, etc. These are proved to be a perfect fit for Vietnamese cuisine and a good companion for every home cook”, said Linh. Becoming the brand advocate, she also confirmed her trust in its findings and long-term commitments in making a set of cookware that has outstanding performance and is a dedicated aid for kitchen explorers. For her, food hygiene and safety should be every person’s priority. Representatives of Minh Long’s marketing consultant panel also joined renowned culinary experts and food aficionados in a thorough discussion about the potentials that these products bring to customers, and knowledge in choosing kitchen utensils, food with traceable origins and cooking methods that are healthy for people of all ages. In light of said criteria, Healthycook Premium Porcelain cookware is deemed to be a big leap from earthenware with more cultural and technology additions. 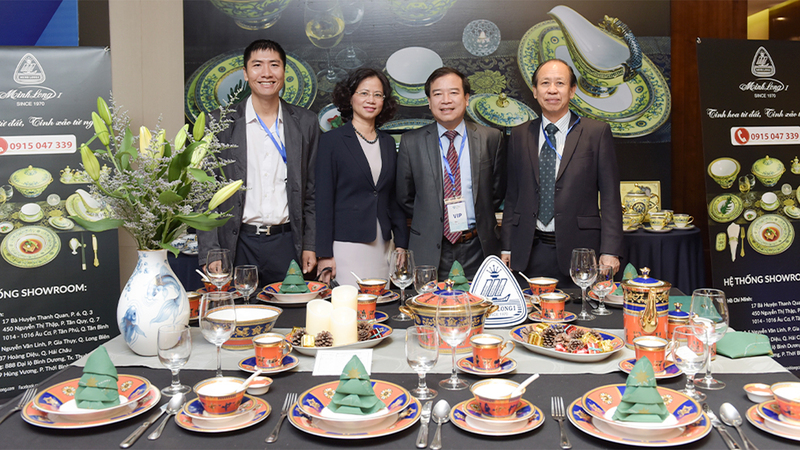 Mr Hung Vo, marketing consultant of Minh Long gave a speech on macrobiotic porcelain and Minh Long’s core brand message. “As a lecturer teaching food culture, a piece of Vietnam’s earthen cookware plays a unique role in my perspective. It is Mom’s clay pot. Vietnamese cuisine is known for its light meals that benefit the digestive system. The clay pot for traditional cooking is our own symbol because Vietnam, an agricultural civilization and economy used to attach its progress with paddy fields and clay mines. Minh Long has dwelled on this concept to create a meaningful set of products. At the end of the day, a small speck of clay could do more things than we’d ever expected”, said Ms Bui Thi Minh Thuy, lecturer of University of Technology and Education. 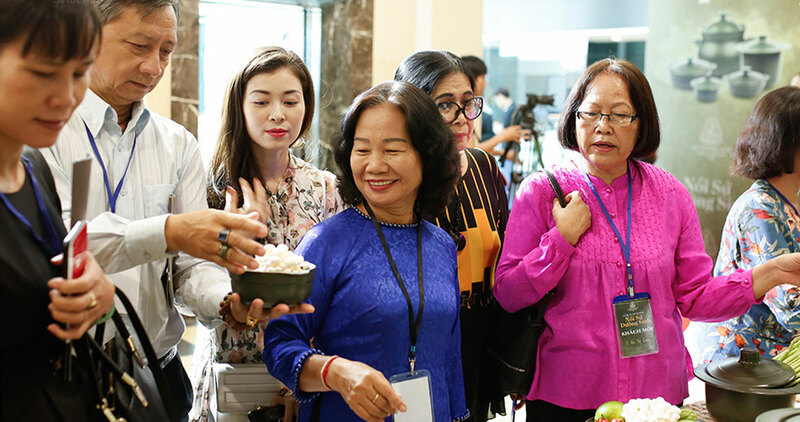 Culinary experts Chiem Thanh Long, Bui Thi Suong, Trieu Thi Choi and Bui Thi Minh Thuy were attending a demo of the cookware’s special functions. On a production plan to meet professional kitchens’ requirement at a larger scale, Mr Ly Ngoc Minh confirmed Minh Long is able to produce pots of up to 30 liters in volume, and that recent researches are looking into pot sizes from 40 to 50 liters for restaurants and hotels. More importantly, induction-ready products are on the way of launching. 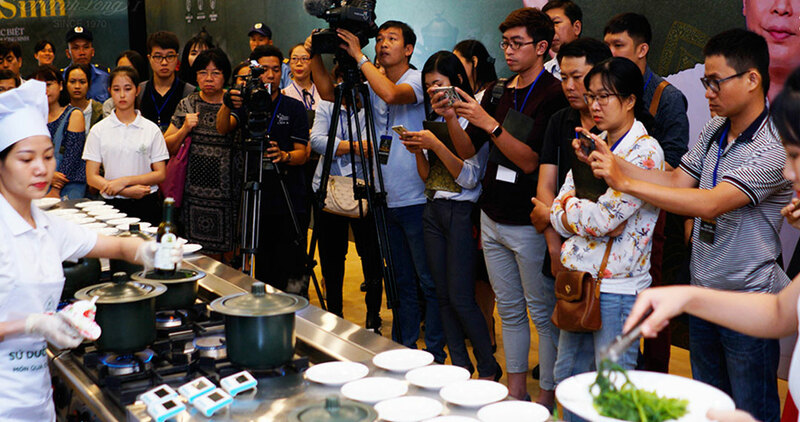 The event’s highlights centered around the cooking show featuring the new product line with famed waterless recipes of common food such as vegetables, sweet potatoes, eggs or whole chicken. Guests were invited to try the food themselves to examine the doneness, juiciness and quality of the dishes cooked in macrobiotic pots. Notably, steamed chicken in lemongrass is among ones that retained gleaming gold, aromatic skin and juicy meat, whereas, fried spring rolls were cooked thoroughly even at low temperature with crunchy wrapping. Guests were invited to have first-hand experience of food from the cooking show and demo all featuring macrobiotic porcelain cookware. 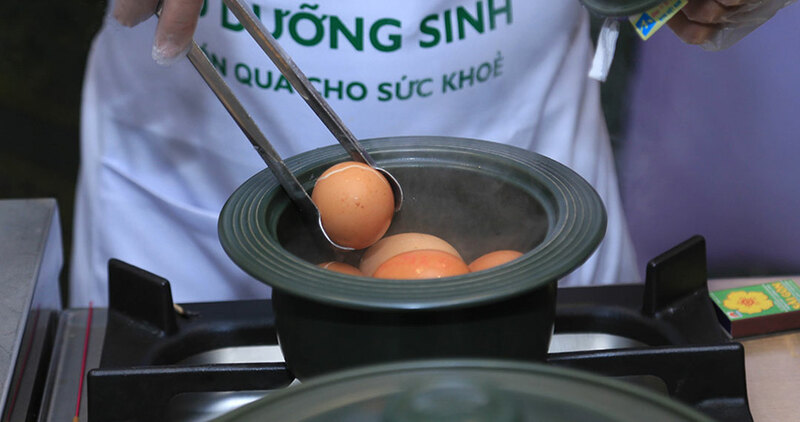 Eggs boiled without water in macrobiotic pots were transferred to serve guests at the event. 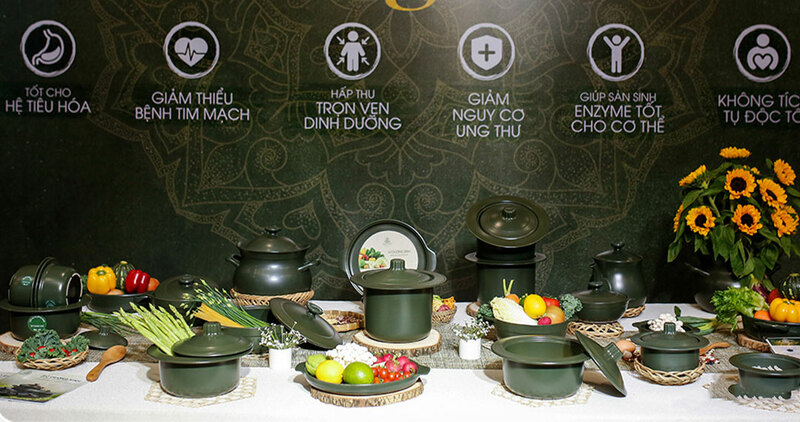 Dubbed as a revolution of earthenware and Vietnamese cookery history in general, Healthycook Premium Porcelain cookware redefines the idea of healthy living, which previously included reshaping eating habit only, by promoting safe cooking utensils to the public. “The new technology enables Minh Long to create products with extreme endurance, therefore, make healthier food. 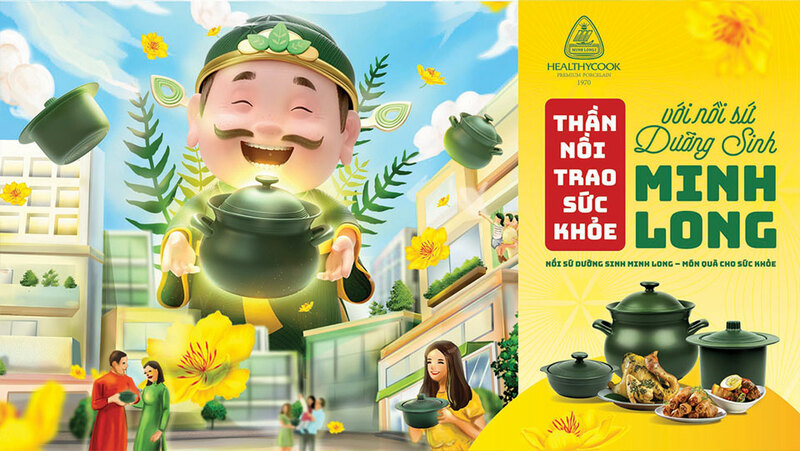 This is a gift I chose to give Vietnamese families nationwide who truly care about their loved ones’ health”, said Mr Minh. The Healthycook Premium Porcelain cookware is available for sales in all Minh Long’s showrooms, distributors, agents, retail chains (AEON Mall, Vinmart, Vinmart+, Tiki.vn, VnExpress online shop, SCJ Home Shopping) and supermarkets. From 24 to 27 April, 2018, Minh Long I Co., Ltd. takes part in Food & Hotel Asia 2018 (FHA 2018), which is organized at Singapore Expo: 1 Expo Drive Singapore 486150. Our booth is in Hall 3 – 3J1-01. This is the seventh time we display our products in one of the largest trade fair for regional catering services and hospitality businesses.